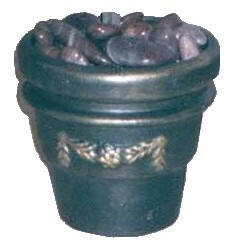 Use an easy painting technique to give common terra cotta or clay pots the look of aged brass; perfect for topiaries, planters or simply to hold a treasured collection of pebbles or seashells. Though it is not absolutely necessary, I do suggest that you use paints that are suitable for painting on clay pots. Patio Paint is the type that I used, but other similar paints will be perfect. Paint your pot in Pine Green and allow the paint to dry. Mix together, one part water and one part Metallic Gold paints and blend them well. Using a damp sea sponge, dipped in the paint mixture, wipe the entire pot. Apply as much of this mixture as required to achieve the desired finish. Allow the paint to dry. Using a dry paint brush, pick up a small amount of Metallic Gold paint (not diluted with water), dab excess paint onto a paper towel and gently brush small amounts of paint onto the embossed (or raised) areas of your pot and around the rims and edges. Apply very small amounts of paint until you have the desired affect. Be sure to allow each layer of paint to dry, before adding the next.